Some visitors who come to ride with Triple Creek at Jack London State Historic Park have no idea who Jack London was. Or they have vague memories of some “dog-story writer guy” or “the dude who wrote that thing about making a fire.” (We’ve even had people say, “Wasn’t he the Beat writer?”—thinking of Jack Kerouac, of course.) We hope that after a visit to the park and a horseback tour that our guests leave with something more: an appreciation for an extraordinary man who lived in an exceptional place. Jack London was an adventurer, novelist, journalist, photographer, sportswriter, war correspondent, memoirist, travel writer, playwright, politician, sailor, fighter, rancher, horseman. He lived only 40 years —but what a 40 years. He was born a poor boy in 1876, the same year as the Battle of Little Bighorn, or Custer’s Last Stand, which is regarded as the unofficial end of the “wild west.” And Jack London died “rich” and famous in 1916, during World War I. In between, the advent of automobiles, airplanes, telephones, electricity, and motion pictures changed life significantly. Jack London was determined to wring every last drop out of life that he could. He first came to Glen Ellen as a getaway from his East Bay home to work and relax in the “country.” London fell in love with the area, and he fell in love with a woman who was typing his work, Charmian Kittredge. Alas, London was already married, with two young daughters. And Charmian was not only five years older than Jack, she was something of a scandal—an expert horsewoman who, shockingly, rode astride instead of sidesaddle, and who wasn’t afraid to work outside of the home or speak her mind. She was a good match for an adventurous man. London divorced his wife in 1905 and married Charmian and they started building their Beauty Ranch together—and traveling the globe. As always, wherever they were, there was work, and because of Jack London’s vigorous, muscular style of writing he remains one of the most widely read American authors in the world. London wrote thousands of letters, hundreds of articles and more than 50 books, including his well-known dog stories—“Call of the Wild” and “White Fang” —the highly regarded novel “The Sea-Wolf” and memoir “John Barleycorn” as well as plays and short stories. “To Build a Fire,” the classic short story about a battle for survival, was actually written twice (in the earlier, lesser, version the man lives). London became the first writer to make more than a million dollars, back when that was serious money, but he was always in debt, in no small part due to the Beauty Ranch and his strenuous efforts to improve it. Jack London also had a real weakness for strong horses. He bought a prize Shire stallion (the largest breed) to stand at stud, and he and Charmian always kept riding horses for their own use and for their many guests. After Jack died, Charmian and Jack’s stepsister, Eliza Shepard, kept the ranch going, and, for a time, ran it as a dude ranch for guests who wanted to come out to relax and ride. So when guests come for a horseback ride at Jack London State Historic Park they are doing something entirely historically appropriate. Jack London led such a vital, colorful life that there have been many biographies written about him (we especially like “American Dreamers” by Clarice Stasz), and more are being published all the time. Someday, it is to be hoped, there will be a good movie about his life. 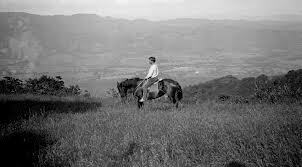 In the meantime, we’ll always have his work to read and trails on his beautiful Glen Ellen ranch to hike and ride and we know that people from around the world will discover and appreciate Jack London time and time again.